Because of their casual style of entertaining|! !| which favors gathering around the two kitchens that flow from the family room|! 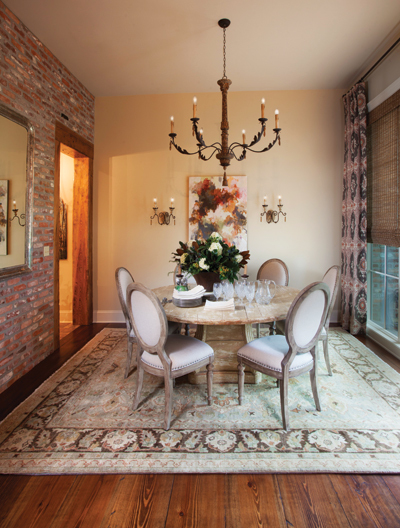 !| the Hutchisons considered not including a formal dining room in their new home. But architect Edson Davis pointed out its aesthetic merits|! !| so the collaboration began|! !| inspired by decorator Mindy Bernard. She installed lighting and custom draperies from Entre Nous|! !| and added dreamy bursts of color with mixed media art work by Joyce Howell. With the slightest hint of a drop in temperature, the stone fireplace is ablaze in the Hutchison home. Mirroring this effect, the outdoor kitchen’s fireplace crackles as well, filling the air with the sweet scent of burning logs enlivened by cool winds rustling through the trees. It’s the family’s favorite time of the year. The winter weather brings a season filled with games and barbecues, elves and reindeer, and holiday celebrations leading up the onset of the Carnival season. Family traditions abound at this stylish new home in the heart of Lafayette, threading a fabric of harmony and seasonal cheer. “The Elf on the Shelf watches over the children and reports to Santa, but every morning, he’s in a different place,” says Ashley Hutchinson, whose daughter, Riley, 12, and son Michael, 9, enjoy participating in the myriad celebrations culminating with festivities that come with the new year. “Sometimes, he may have gotten into the Monopoly game. Other times, the elf’s in the kitchen,” she continues. “Of course, Jim lights the fire as soon as it gets cool and it stays on. This is where the family connects, recounts their days and gathers,” Ashley says of the spacious family room with 14-foot ceilings, wide plank antique heart pine flooring, exposed beams and the beloved fireplace. Childhood sweethearts from Lafayette, Ashley and Jim Hutchison wanted to build their new house near the waterfront with the idea of bringing family together for casual gatherings. In devising the recipe for their dream home, the couple made sure that a spacious outdoor kitchen, a pool, a generous indoor kitchen and an abundance of cozy fireplaces were primary ingredients for their custom-built residence. But a structural concern stopped them in their tracks. “Two-and-a-half years before we began building, we bought a lot on the river, because we wanted to live on the river,” Ashley explains. “But later, we realized that it probably would not support a pool, so we sold the river lot and bought one two doors down. This is where we ended up building.” The conceptualizing process took approximately a year from start to finish. Top left The rustic master bedroom features exposed beams and a king bed from Restoration Hardware. It’s adjoined to an elegant master bath with a delicate chandelier and hand-cut travertine tiles originally destined for the kitchen. Top right The family gathers around the island and grill in the well-equipped outdoor kitchen. It’s protected by a “mosquito system,” says Ashley. “It surrounds the parameter and goes off automatically in the morning and at night,” making it possible to linger outdoors. Bottom Right The family room offers a splendid view of the pool and outdoor kitchen, and is centered by a fireplace topped with a mirror from Fireside Antiques. To the left is a built-in antique cypress custom cabinet faux-finished by Brooke Wilke Hoogendoorn. Bottom Left The spacious kitchen flows seamlessly into the outdoor kitchen and family room. Elements include antique pine ceiling beams and lights from Bevelo, travertine flooring and a travertine hood, seating at the custom island and a separate dining area. Visual connection of interior and exterior spaces was important, as was the easy flow of people between inside and outside during gatherings. A large amount of natural light was desired, although minimizing heat gain was required. The owners wanted a sleek, serene environment devoid of clutter. The living areas were to exhibit exposed bricks, rustic wooden beams, antique cypress custom cabinets and natural stone elements. After a neutral color palette was selected, subtle variations of soft colors were added for visual interest. A modern aesthetic prevails in the new 4,700-square-foot home, which exemplifies Jim and Ashley’s laid-back style of living. A seamless integration of natural light and materials, rich textures and muted colors makes the living areas utterly inviting and cozy. There are intriguing architectural and design flourishes throughout. A clever wine nook in the kitchen contains all the necessities within a diminutive corner space flanking the large kitchen, designed with travertine flooring, a custom island and a spacious breakfast area. Michael’s bedroom (top) and Riley’s bedroom (bottom) are situated on the second floor, which features two private baths and a shared game room. “They pretty much own the upstairs!”says Ashley. “The game room is where they study, work on their computers, watch movies and games, and visit with friends.” Long leaf pine flooring complements the casual, streamlined décor and neutral color palettes that are enhanced with subtle pops of color. While the first floor has retained a rather rustic and traditional ambience, the second floor that features the children’s bedrooms and living room has the feel of a contemporary, sleek and streamlined space. The family room, which is centered by a large fireplace, was designed to have a splendid view of the covered outdoor kitchen. With a flat-screen TV over the outdoor fireplace (a magnet during game days), an island with bar stools surrounding a grill and an ample seating area designed for family creature comforts, the Hutchisons' spacious outdoor living room serves an extension of their family room. Brick archways lead to the fenced-in pool and hot tub surrounded by a serene backdrop of trees, giving it a country feel within the heart of the city. The Hutchisons are enjoying an easy living sensibility that’s both practical and casually chic, two elements that strike and artful balance for a cozy home with a stylish glow. The residence resonates with warmth and invites all who enter to pause, relax and savor the moment. Thanks to the vision of the design team, the streamlined décor and natural materials embrace the relaxed, tasteful lifestyle of the homeowners.